Home / Family Scribble – Fun For The Whole Family! 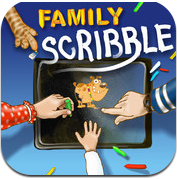 Family Scribble is the kind of app that makes you wonder what in the world could improve it?!? Hi Everyone, I’m the one on the right. I must say I have been having a blast with this app – But you may notice that in the videos. Vladimir Zivkovic said there is more to come for this app. I’ll be doing my spring cleaning now – so I have time to play. Family Scribble is a bonding tool, just like a great board game, only when it comes to life the possibilities are endless! This app is guaranteed to bring out the creativity in kids of all ages. There are amazing touches in the use of pencils, chalk, and brushes that look, feel, and sound like the real thing. Multiple backgrounds to choose from makes this the perfect app to create everything from party invitations to a very cool shopping list! You can draw stick figures or pour on the talent and create a masterpiece worth framing, this app has the tools to do either. The “Buy” button will take you to the free version. We wanted to show you what the full version contains. This is a Must Have Family App! Teachers, Group Leaders, Heads Up! 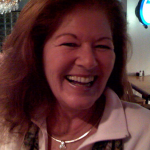 This is a fantastic tool for creativity, fun, laughter, and enhancing self esteem! Realistic Pencil, Chalk, Brush, Sounds and Experience! Write to Santa or Send Your Honey A List! 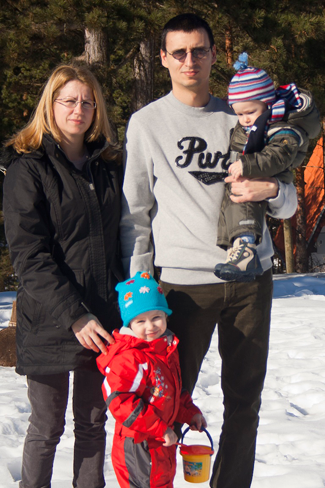 Meet The Family of Developers! What was your initial inspiration for this app? Since we bought the first Android tablet, and later iPad, i have installed many painting applications but none were able to keep attention of my kids (1.5 and 4 at that time) for any length of time. They would open one of apps, draw by few minutes in next 3-4 days and that was all. So i got the idea to make painting more fun and creative by adding special visual and audio effects – kids just love movement and audio. for almost one year, since I start developing it). I hope your kids will enjoy the app in same way. I would like to hear your suggestions, issues, and updates on your family experience, so I can improve the app in future updates.